The original classic network game, Doom comes to Xbox Live Arcade. With enhanced High Defnition Graphics, 5.1 Surround Sound, and 4 player co-op and deathmatch gameplay both on splitscreen and Xbox Live. You will be able to play through the original 4 episodes and save mars once again. 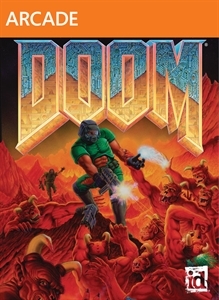 Originally released in 1993, DOOM introduced millions to the white-knuckle excitement of the First Person Shooter (FPS). Relive the classic demon-blasting action, now with up to four players over Xbox Live®, 5.1 Surround Sound, and smoother graphics. You're a Marine stationed on Mars when a military experiment goes wrong. Your mission: Blast your way to freedom through the classic world of DOOM. Face off against Hell’s army, including stampeding demons, and lay waste to rooms of monsters with an arsenal of classic weapons. Take the deathmatch online via Xbox Live and battle your friends for dominance of the leaderboards. Gameplay: Experience all the classic DOOM levels, monsters, and weapons. Play the entire single-player game solo or in co-op mode via split screen or over Xbox Live. Multiplayer: Play up to four-player deathmatch, either in split-screen or on Xbox Live. Earn achievements and check the leaderboards for the high scores. Next-generation features: With 1080i HD support, 5.1 Surround Sound, and smooth textures, this is DOOM for the next generation. See: "Doom 3 BFG Edition". June Backward Compatible update released! Playing custom doom maps - is it possible?